MacDonald Training Center‘s Employment Services connects job seekers to businesses in the community that have a need for their unique skills, talents and abilities. Businesses that are inclusive – in recruitment, retention and advancement – benefit from a wider pool of talent, skills and creative business solutions. Additionally, neurodiverse work environments that are flexible and open to the talents of all qualified individuals, including those with disabilities, actually promote workplace success for everyone. As the premier provider of disability neutral employment placement services for people with disabilities in Hillsborough County, MTC provides employment placement services to adults with many challenges, including hearing impairments and other physical or cognitive disabilities. MTC’s 40+ years of connections to the business community includes decades of partnerships with Human Resource Specialists through our various associations, including a Business Advisory Council and other advisory relationships. MTC is an active member of the Tampa Chamber of Commerce, Tampa Downtown Partnership and the Westshore Alliance as a means of soliciting job placements. Our roster of 60+ active employers ranges from Bank of America to the Seminole Hard Rock Café. We are particularly aware of and sensitive to the need for these employment placement supports to assist hearing impaired young adults transitioning from school or college into the community. Our long standing relationships with the Florida Department of Education through Hillsborough County Schools (including on-site teachers for our Adult Day Training) and collaboration with the Division of Vocational Rehabilitation, is an ongoing source of referrals for placements. We’ve received partnership status with Florida’s new Unique Abilities Partner Program and look forward to utilization of this new resource. MTC is an active member of the Tampa Chamber of Commerce, Tampa Downtown Partnership and the Westshore Alliance as a means of soliciting job placements. Our roster of 60+ active employers ranges from Bank of America to the Seminole Hard Rock Café. MTC’s connections to the local business community run deep and will assist both the job seeker and employers to find the right match. Our highly experienced Employment team is ably assisted in finding community based employment by an exceptionally well-developed Business Advisory Council (BAC). This core group of private business sector professionals guides us in providing progressive, innovative, and effective services to both the persons served and the business community. Most of the members of this Council are Human Resource specialists who are responsible for many referrals as well as placements into community based jobs for the people we serve. The BAC is currently chaired by human resource specialists from Time Warner Communications. Over the decades it has been lead by professionals from Tampa International Airport, Walmart, the Grand Hyatt Hotel, and many other local employers of significance. MacDonald Training Center is committed to working with both employer and employee to help ensure the best possible match. If you are an employer in need of qualified staff, email us to discuss your unique needs and how we may find a well suited candidate for your consideration. We will be happy to discuss the many benefits of having an inclusive, neurodiverse workforce! Let us meet your needs through Customized Employment–which means carving out a job based on the needs of the employer and the talents of the job seeker. DIVERSITY TRAININGS: MTC is committed to improving the way organizations hire and train people with disabilities. Our employment experts work with large and small businesses to provide diversity and employee training, and any assistance needed for the duration of employment! The Work Opportunity Tax Credit (WOTC) is a Federal tax credit available to employers for hiring individuals who have consistently faced significant barriers to employment. Disability Equality Index–is a resource full of practical advice, best practices for businesses interested in effective ways of diversifying their workplace. Kelapo Extra Virgin Coconut Oil is the newest addition to the MTC family of business partners. Founder Erin Meagher needed dependable employees and hired two of MTC’s Advanced Job Skills trainees! Erin reports that they are capable, efficient employees fully integrated within the organization. The addition of the two new teammates, she says, has increased productivity and been well received by all. Ms. Meagher is a former high school business teacher who branched out into her own business in 2009. 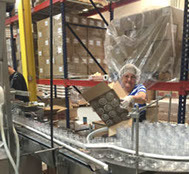 Kelapo’s assembly line looks amazingly like our SunPass production area and was a natural fit for trainees familiar with MTC packaging contracts. Kelapo was created as a sustainable Extra Virgin Coconut Oil which is organic, Fair Trade Certified, and Vegetarian Approved. For more information on Kelapo, please visit their website at www.kelapo.com. See how easy it is to find that well suited match.